Mount Isa Filipino Australian Association’s President Ric Marino and their Treasurer Ellen De Sagun, personally went to the Philippines to see Sagip Kapamilya heads Jun Dungo (Sagip Kapamilya Program Director) and Marcel Riñon (Sagip Kapamilya Deputy Director) to formally turn-over their donation of 15,000 Australian Dollars. In photo: (L-R) Jun Dungo (Sagip Kapamilya Program Director), Ric Marino (Mount Isa Filipino Australian Association President), Ellen De Sagun (Mount Isa Filipino Australian Association Treasurer) and Marcel Riñon (Sagip Kapamilya Deputy Director). Knowing the havoc caused by the super typhoon Yolanda last year, the Filipino Australian Association started to collect donations from their fellow Filipinos and Australian friends who also wanted to help affected citizens. 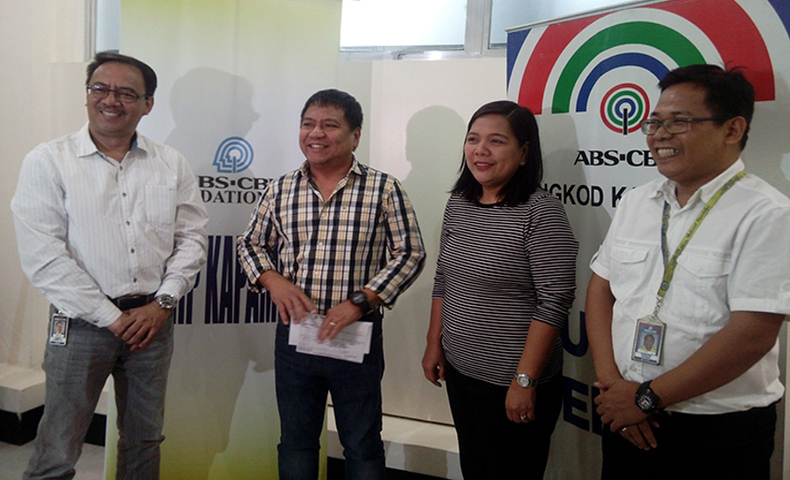 Their given donation will be used for Sagip Kapamilya’s Yolanda rehabilitation projects.